Packaging design is tricky to get right, even for otherwise competent designers. There are times that the appealing flat plan looks regrettably uninspired once assembled. Or worse, the foil wrapper crinkles in such a way, a rude word is now proudly emblazoned across the front. They are remarkable in their ability to uniquely identify a product and recall the associated information. Patients in hospital are assigned barcodes, including babies at birth. The Police even use them to log evidence, but there is a more obvious connotation. Shopping. The bleeping of the supermarket checkout is triggered by the product barcode passing above it. Yet despite being a requirement for most packaging, it is with shameful frequency they are an ugly afterthought. A stark blot dropped by the designer into an otherwise acceptable design. 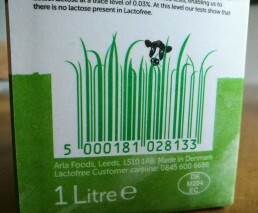 We hereby celebrate the clever soul at Arla Foods who used this idea on their Lactofree milk. Grass is eaten by cows, and cows produce milk. Wonderful.